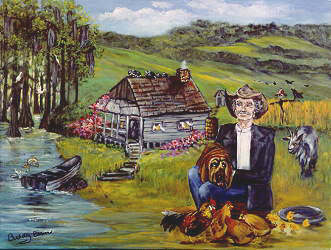 Buddy Ebsen's Uncle Jed Country - "Uncle Jed Country"
The Original painting is available for purchase. Contact us for details. Just as in a movie, books, or playing, the beginning sets the mood. It establishes the characters, the place and the rim, it tells a story. This is Uncle Jed Country. This series is going to take you where he lives, what he does and what he most enjoys. He hopes you will share the simple pleasures and when you look at these paintings, you can enjoy a time gone by. This is where he lives, with his friend, Red, his faithful dog, Duke, and a few assorted critters that you will meet in other paintings. His house has all the comforts that he needs: kerosene lamps, outdoor plumbing. His boat is beached at his door just waiting for a shove into the Bayou. After fishing, a tasty dinner of catfish in front of a fireplace; who could wish for more?